MONTEREY, Calif., Aug. 13, 2010 – Ford gave the green light only once before: In 1968, management approved a special Mustang – a car that sacrificed nothing in its quest to be the best all-around road-going performance machine ever created by Ford Motor Company. That car became the 1969 Mustang Boss 302, and it remains one of the world’s most sought-after examples of American performance. Forty-two years later, Ford has given the green light again. The team of Ford engineers, designers and stylists – all Mustang enthusiasts to the core – that created the groundbreaking 2011 Mustang GT has distilled a new model to its purest form, strengthening, lightening and refining each system to create a race car with a license plate. 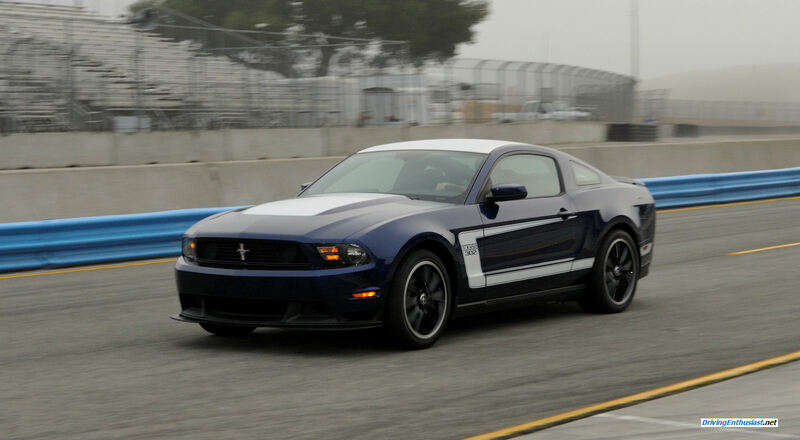 Its name: the 2012 Mustang Boss 302. To celebrate the racing heritage of the new Mustang Boss 302, Ford will also offer a limited number of Boss 302 Laguna Seca models, named for the track where Parnelli Jones won the 1970 Trans-Am season opener in a Boss 302. Aimed at racers more interested in on-track performance than creature comforts, the Boss 302 Laguna Seca has increased body stiffness, a firmer chassis set-up and an aerodynamics package carried over almost in its entirety from the Ford Racing Boss 302R. Driving the 2012 Mustang Boss 302 was intended from the outset to be a visceral experience, packed with raw, unbridled performance across the spectrum: Acceleration, handling, braking, and top speed are all equally matched for perfect balance on a car operating within the framework of legally defined safety, noise and emissions regulations. Led by Mike Harrison, the V8 engine team approached Boss from the top down: With 412 horsepower from 5.0 liters, the 2011 GT engine was already an incredible performer. But to achieve the high-rpm horsepower that would make the engine competitive on the track, a new intake was essential. The resulting runners-in-the-box plenum/velocity stack combination the engine team developed was impressive enough that it got the green light after one short drive. Helping the intake build power, revised camshafts using a more aggressive grind are actuated with the same twin independent variable camshaft timing (Ti-VCT) mechanism used on the Mustang GT. More aggressive control calibration yields 440 horsepower and 380 lb.-ft. of torque, while still offering a smooth idle and low-end torque for comfortable around-town driving. A race-inspired clutch with upgraded friction materials transmits power, while a short-throw, close-ratio six-speed manual transmission handles gear change duties. Power is delivered to a 3.73 ratio rear axle using carbon fiber plates in the limited-slip differential to improve torque handling and longevity. For those who want even more precise control over power delivery, a torque-sensing (Torsen) limited-slip differential is an available option coupled with Recaro front seats. While the powertrain team defined output targets that would yield an ideal balance with the chassis, another team made sure the car made the kind of sounds owners and enthusiasts would expect from a Mustang Boss. Up front, a Boss-specific intake system is tuned to feed the engine with minimum restrictions. A retuned induction sound tube provides concrete aural evidence of what’s occurring under the hood. And, in the Boss exhaust system engineers really had some fun. “With an exhaust system, we have to consider three constraints: legal noise restrictions; backpressure, which can rob power; and ground clearance,” explains Shawn Carney, Mustang NVH engineer. “Since the 2011 Mustang GT exhaust is already so free-flowing – it came in way under our backpressure targets – we already had excellent performance; we were able to tune the exhaust system for a unique sound. Combined with the rush of the intake, the exhaust system really envelops the driver in V8 sound. Every Boss features a unique quad exhaust system: Two outlets exit in the rear similar to a standard Mustang GT. The other two outlets exit to either side of the exhaust crossover, sending exhaust through a set of metal discs that act as tuning elements before the pipes terminate just ahead of the rear wheel opening. Visually subtle, the side pipes flow very little exhaust but a lot of exhaust sound, providing a sonic experience unlike any other Mustang – and giving home tuners an additional avenue for modification. In keeping with the Boss mandate to provide the best-handling Mustang ever, the already strong Mustang GT suspension system has been further refined. Higher-rate coil springs on all four corners, stiffer suspension bushings and a larger-diameter rear stabilizer bar all contribute to the road racing mission, and Boss models are lowered by 11 millimeters at the front and 1 millimeter at the rear versus the Mustang GT. The real key to handling, though, is in the adjustable shocks and struts, standard on all Boss Mustang models. Also unique is the method of shock adjustment. Ditching the weight and complexity of electronic wizardry, the Mustang team opted for traditional race-style hands-on adjustability – similar to the Gabriel shocks available on the original Boss 302. To complement the suspension, the speed-sensitive electronic steering system has been retuned to maximize feedback and road feel to the driver. The driver is also given the option of fine-tuning the steering feel to his liking by selecting one of three settings through the instrument cluster menu: Comfort, normal and sport modes help offer track-tuned steering when desired without sacrificing low-speed maneuverability in parking situations and everyday commuting. Similarly, Boss receives unique traction control system (TCS) and electronic stability control (ESC) settings to help drivers achieve maximum performance whether on the street or at the track. Both systems can be completely disabled in controlled track situations where maximum driver skill is utilized, or fully engaged for maximum safety during normal driving or in less-than-ideal traction conditions. Intermediate sport mode allows drivers to push their cars hard at the track without completely disabling the safety systems, permitting more aggressive driving before the TCS and ESC systems intervene. Working in concert with the suspension upgrades, Boss 302 receives unique, lightweight 19-inch black alloy racing wheels in staggered widths: 9 inches in front, 9.5 inches in the rear. The Pirelli PZero summer tires are sized specifically for each end of the vehicle, with the front wheels receiving 255/40ZR-19 tires while the rear stays planted thanks to 285/35ZR-19 rubber. The combined suspension and tire package allows Boss to achieve a top speed of 155 mph and become the first non-SVT Mustang ever to achieve more than 1.0 g of lateral acceleration. Boss braking is also up to the challenge, using Brembo four-piston front calipers acting on 14-inch vented rotors up front. In the back, standard Mustang GT brakes are upgraded with a Boss-specific high-performance pad compound. Combined with vented brake shields and unique Anti-Lock Brake System (ABS) tuning, Boss drivers get maximum control and rapid, repeatable fade-free stops in road and race situations alike. The Mustang team spent considerable time ensuring the brake pedal feel met the expectations of performance drivers. Boss receives unique low-compressibility brake lines that expand up to 30 percent less than traditional flexible brake lines, allowing maximum fluid pressure to reach the calipers in the least amount of time, giving the driver a sensation of being connected directly to the brake pads. As a result 60-0 stopping distances for the Boss are improved by approximately three feet versus the Mustang GT with available brake package; combined with suspension and engine improvements, Boss is expected to show approximately a two-second lap time improvement over the GT on a typical road race course. But the numbers tell only part of the story. Changes to the Mustang Boss exterior are subtle but unmistakable. True to its race-bred heritage, every component that could potentially aid aerodynamics or engine/brake performance was examined to make the vehicle more competitive, while chief designer Darrell Behmer refined the styling to evoke the 1969 Boss in a contemporary way. To set Boss apart, each car will have either a black or white roof panel, coordinated to the color of the side C-stripe. Available exterior colors are Competition Orange, Performance White, Kona Blue Metallic, Yellow Blaze Tri-Coat Metallic and Race Red. Up front, a unique fascia and grille are highlighted by the blocked-off fog lamp openings and aggressive lower splitter, a version of the design used – and proven – on the Boss 302R race car. The front splitter is designed to function at high speeds by efficiently managing the air under and around the car. It helps to reduce underbody drag and front end lift while more effectively forcing air through the Boss-specific cooling system. At the rear of the car, the spoiler was chosen to complement the front aero treatment and minimize overall drag. Inside, a unique Boss steering wheel covered completely in Alcantara suede complements the standard seats, which are trimmed in cloth with a suede-like center insert to firmly hold occupants in place. Boss customers who want the ultimate seating experience can select a package that includes Recaro buckets, designed by Ford SVT in cooperation with Recaro for high performance Mustang models, and shared between the Boss and GT500. A dark metallic instrument panel finish, gauge cluster and door panel trim also differentiate Boss from the standard Mustang, while a black pool-cue shifter ball and “Powered by Ford” door sill plates further remind customers they’re in a special car. The Boss interior gets an aural kick thanks to what’s been removed. Eleven pounds of sound-deadening material have been eliminated to let occupants further enjoy the intake, engine and exhaust note.